The light-emitting diode (LED) is transforming the way we light our cities and towns offering a once-in-a-lifetime chance to radically improve how we use energy and our outdoor spaces at night. With this opportunity comes an obligation to manage these changes responsibly and sustainably. The stakes are high and the potential rewards great, but outcomes depend critically on policymakers and the public having access to reliable information. IDA developed this document to provide planners, lighting designers and public officials an overview of the most important aspects of LED lighting and the choices and challenges involved in its municipal implementation. LEDs use solid-state technology to convert electricity into light. They are a variant of semiconductor devices that enable miniaturized computing devices like PCs and smartphones. Put simply, LEDs are very small light bulbs that fit into an electrical circuit. Unlike traditional incandescent bulbs, they don’t have a filament that burns out and they don’t get very warm. Initially, LEDs only emitted red, yellow, or green light, but now white LEDs are widely available. Early LEDs were relatively inefficient regarding energy use and the amount of light emitted, but due to technological advances, LED efficiency and light output have doubled about every three years. Because of their improved quality and lower prices, LEDs are now replacing conventional high-intensity discharge (HID) lamp types for outdoor lighting in communities around the world. LEDs are very efficient at converting electrical energy to light. This means LED lighting can generate the same quantity of light for a fraction of the cost and energy usage compared to conventional lighting technologies. The use of LED lamps coupled with modern luminaire design allows for reduced illuminance without compromising safety. LEDs help lower carbon emissions by reducing the demand for energy, which is still largely produced by burning fossil fuels. Another benefit of LEDs is better control over the spectral content of light. There are many LED options available that provide accurate color rendition without emitting excessive amounts of potentially harmful blue light. (see below). 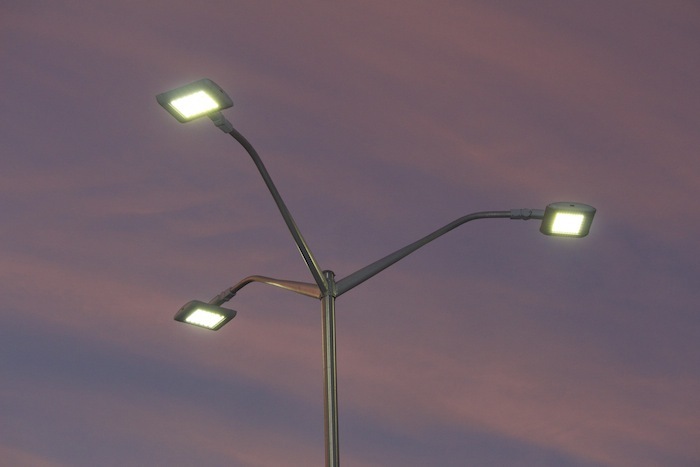 Relative to other commonly-used outdoor lamps, LEDs are thought to be extremely long-lived. Laboratory studies indicate lifetime ratings in the range of 25,000-100,000 hours of continuous operation, making them virtually maintenance-free. When turned on, LEDs are instantly at full brightness, unlike HID lamps that have a significant time delay. LEDs also have very low minimum energy thresholds to produce light, meaning they can be dimmed to much lower illumination levels when less light is needed, resulting in further energy savings. Lumen Output: How much light is produced relative to the amount required for a particular task? When replacing existing fixtures it is important to use the only level of illumination needed, and not to adopt unneeded increases in brightness. Correlated Color Temperature (CCT): Does the light have a “warm” or “cool” color quality? Closely related to all these factors is expense: How much will LED replacement solutions cost? The price of commercial LED lighting products continues to drop, and capital cost recovery times for new LED street light installations, once 10 years or more, are now typically less than five years and continue to decline. As barriers to implementation fall, LED is gaining momentum as a lighting technology of choice in new outdoor installations. New technical capabilities often come with unanticipated challenges. White LED lighting often has significant levels of potentially hazardous blue light. IDA published a report in 2010 detailing the hazards of blue-rich white light sources. In the years since, scientific evidence has solidified around its conclusions. Outdoor lighting with high blue light content is more likely to contribute to light pollution because it has a significantly larger geographic reach than lighting with less blue light. Blue-rich white light sources are also known to increase glare and compromise human vision, especially in the aging eye. These lights create potential road safety problems for motorists and pedestrians alike. In natural settings, blue light at night has been shown to adversely affect wildlife behavior and reproduction. This is true even in cities, which are often stopover points for migratory species. Always choose fully shielded fixtures that emit no light upward. Use “warm-white” or filtered LEDs (CCT < 3,000 K; S/P ratio < 1.2) to minimize blue emission. Look for products with adaptive controls like dimmers, timers, and motion sensors. Consider dimming or turning off the lights during overnight hours. Avoid the temptation to overlight because of the increased luminous efficiency of LEDs. Only light the exact space and in the amount required for particular tasks.